The Winter Garden Theatre in Toronto is historic for any number of reasons. Open since 1913, the downtown institution, nestled seven stories above its sister property The Elgin Theatre, is the last of the Edwardian stacked theatres in the world. A functioning venue for the 100+ years it has existed, it played (and still plays) a crucial role in Ontario’s cultural life, with events as disparate as vaudeville, opera, silent films and dramatic plays gracing its stage. 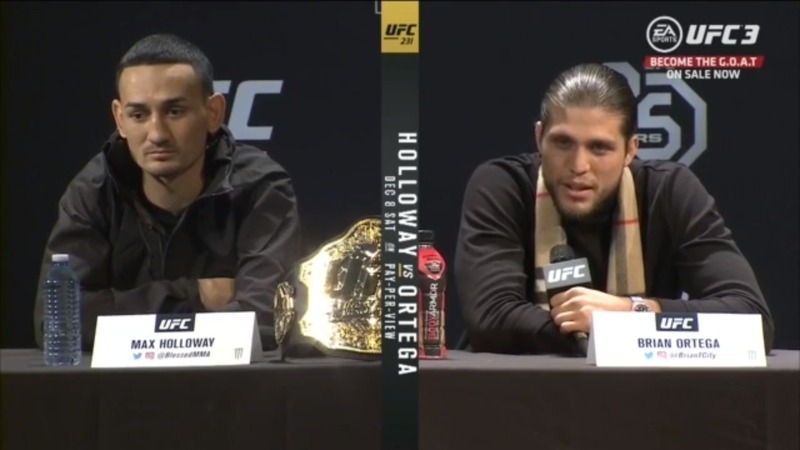 A new sort of drama unfolded on its stage Wednesday evening when Max Holloway, Brian Ortega, Valentina Shevchenko and Joanna Jędrzejczyk gathered at UFC 231’s official press conference. The floral garden motif of the theatre seemed somehow an appropriate setting that recalled Holloway’s homeland of Hawaii and Ortega’s SoCal abode, and allowed those in attendance to forget the crisp winter winds swirling outside. The fighters agreed as both attempted to adopt the city as their own. For his part, Holloway has claimed Toronto the “10th Island” of Hawaii, and had the crowd shouting the phrase throughout the event. Meanwhile, his challenger Ortega proclaimed that, for at least this week, T-City would stand for Toronto-City. The most hotly anticipated featherweight title fight in recent memory, Saturday’s main card collision is an undeniable matchup of two fighters enjoying the prime of their careers. The fact that the fight is so coveted by fans is a testament to the respective MMA prowess of both men. Neither has a penchant for trash talk, both carry themselves with dignity outside the Octagon, and are walking role models to younger fighters. In short, they let their fighting do the talking. The mutual respect between the fighters was reflected in the audience, who showed equal exuberance for both men, often cheering for both. Ortega acknowledged the similarities between he and his opponent. “We’re two young, hungry guys at the top of the mountain,” he said, adding that this first meeting on Saturday will likely not be their last. "This is the beginning." While none of the four fighters emoted anything resembling personal animosity, there was certainly more tension between co-main stars Valentina Shevchenko and Joanna Jędrzejczyk. Having met three times previously in Muay Thai competitions (all wins by Shevchenko), both warriors are profoundly hungry. Shevchenko is hungry for her oft-delayed title shot at her natural flyweight, and Jędrzejczyk hungry to hoist hardware over her shoulder once again and begin her quest to be a two-division champ. Of their previous encounters, Jędrzejczyk seemed unconcerned. “There is no way I will leave this city without the belt,” Shevchenko countered, wielding her own calm confidence. If there was more of an edge in their war of words than their main event counterparts, there was no less mutual respect. Shevchenko waxed on fighting someone with Jędrzejczyk’s track record of professionalism and the certainty that they would meet this Saturday. Jędrzejczyk gave her opponent the nod, too. The UFC 231 presser was evidence that harsh words aren’t necessary to create drama, and the good vibes permeating the Winter Garden Theatre were exuded by the media, the fans, the fighters and even Dana White himself.